I'm occasionally the opposing view in this forum. With that said, I believe the vast majority of posters on here are against Cuban immigrants and all illegals, regardless of ethnicity. If they are illegally here, out they go. Plain and simple. I'm also against the anchor baby syndrome, too. Secular law trumps one's religious beliefs here in the USA. Remember: when in Rome, do as the Romans do. Perhaps that's because the higher socio-economuc classes rarely even see an illegal alien, unless said illegal alien is mowing their lawn. It's easy to be tolerant of someone when you don't have to come into contact with them. I love how everybody ignores this semi-gem of a post. I don't consider myself in a higher socio-economic class, but I do okay, am content, and am not terribly bothered by illegals of any kind. Is it because I'm not competing with them for jobs? Possibly because you live in Spokane...rather than LA, Fresno, or El Centro....possibly because you simply don't get bothered by things...or possibly because you have no personal interest in it, one way or another. Some people are bothered by global warming....high taxes....the shrinking economy....the war in Iraq....and athlete's foot. Others find these issues unimportant. Why? Who can say? I'm not particularly bothered by the daily problems encountered in the New York subway system....for one, because I don't live in New York, and do not use the subway. I'm afraid it's too late..you've 'stepped in it'. 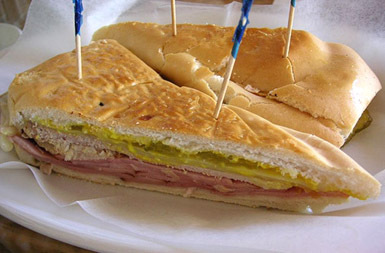 Could I possibly appease you all with a nice Cuban sandwich? mi encanto....como sabrosa....que bonito...and all that stuff.